£26.00 - click here to book online. Encircled by five sweeping valleys opening out to the River Severn and made famous by Laurie Lee’s novel “Cider with Rosie”, the scenery is dramatic around Stroud. The town has attracted and inspired artists for over a century – Victorian designer William Morris to twenty first century art superstars, Damien Hirst and Dan Chadwick. The Museum in the Park is set in the beautiful grounds of Stratford Park. 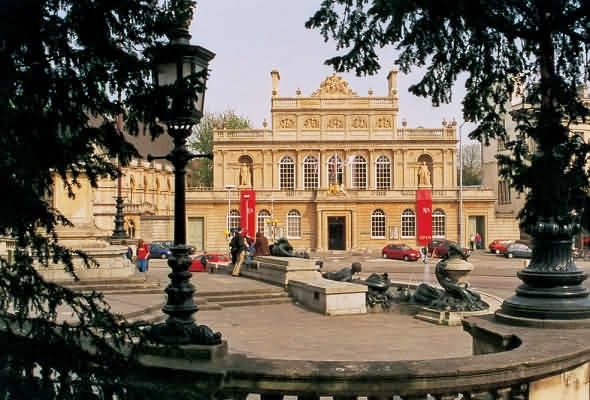 Situated in a Grade II listed 17th Century wool merchant’s mansion house, the collection tells the fascinating story of the Stroud District’s rich and diverse history. With over 4,000 objects on display, including dinosaur bones, historical paintings and even one of the world’s first lawnmowers, there is something to spark the interest of all visitors! 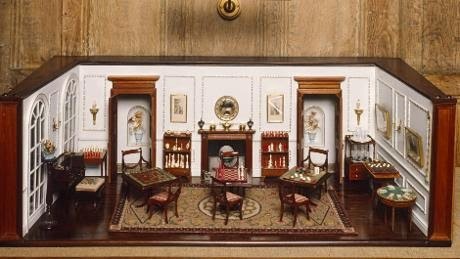 The special exhibition is The Friction Project: a Miniature Museum of Museums. Produced by Flow Contemporary Arts, the project presents a unique interactive artwork created by Tara Downs and Bart Sabel inspired by the collections of three Gloucestershire Museums. After lunch we visit Berkeley Castle. The most remarkable thing about the Castle is that for nine centuries, the building, the Berkeley family, the archives (which go back to the 12th Century), the contents, the estate and the town have all survived together. Its place in history is significant, not just because it is still intact, but because the Berkeley family and their home have played an important part in the power struggles of so many centuries. The Castle is one of the March Castles, built to keep out the Welsh. It has all the trappings to match: trip steps designed to make the enemy stumble during an assault, arrow slits, murder holes, enormous barred doors, slots where the portcullis once fell, and worn stones where sentries stood guard. It is also a fairytale Castle with its warm pink stone that glows in soft sunset light. Outside, the battlements drop some 60' to the Great Lawn below; but inside the Inner Courtyard, the building is on a human scale, with uneven battlements, small towers, doors and windows of every shape and size. The surrounding land would have been flooded for defence. The Family are one of only three families in England who can trace their ancestry from father to son back to Saxon times. English history has been lived out within these walls - and by this family. The Castle is the oldest building in the country to be inhabited by the same family who built it. For centuries, the Berkeleys were close to the throne, able administrators and fighters who supported their king or queen (as long as they could), backed the winning side, and married well. The Castle, naturally enough, is full of stories. The archives, which are still housed in the Castle, date from 1154. They comprise around 25,000 documents relating to the estate, of which about 6,000 date from before 1490. The contents of the Castle are items that have been chosen, collected and treasured by members of the Berkeley family throughout the centuries, and many reflect the history of the place. They include Francis Drake's cabin chest, Queen Elizabeth I's bedspread, and the banner that the 4th Earl of Berkeley took with him to the Battle of Culloden. Many of the unusual tapestries, paintings, ceramics and silverware, have their own story to tell. Edward II was reputedly murdered there on September 21, 1327 by unknown means, although popular stories of a red hot poker or suffocation persist. 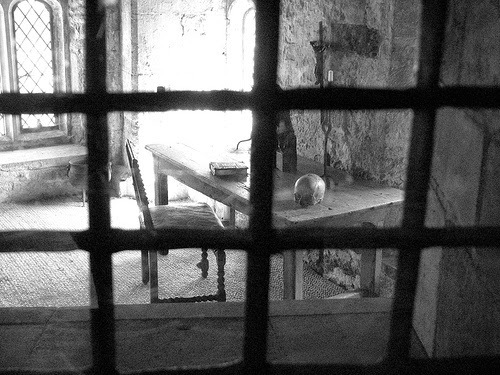 The cell where he is supposed to have been imprisoned and murdered can still be seen, along with the adjacent deep dungeon, which supposedly echoes the events of the murder every year on September 21. 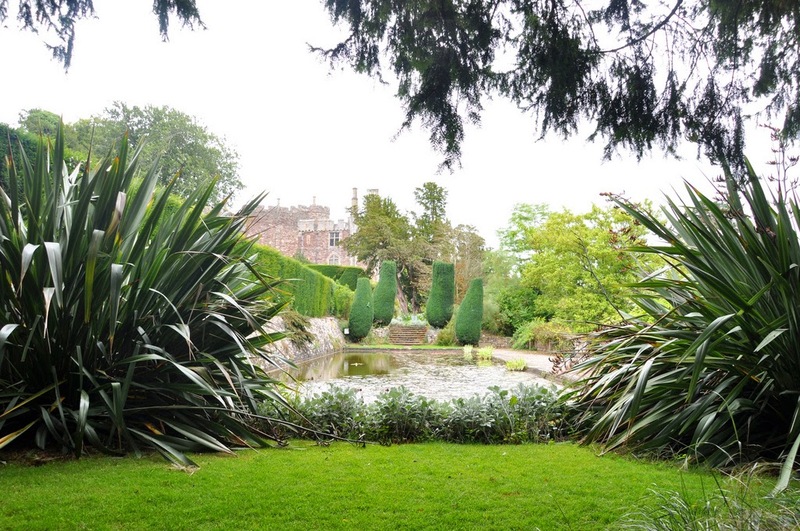 The Castle is surrounded by eight acres of landscaped gardens, including Queen Elizabeth I’s bowling green, sweeping lawns, terraced gardens and the 8th Earl’s swimming pool – now an ornamental lily pond with plume fountain. Enjoy the fabulous collections of roses and magnolias, the magnificent scented borders and a huge range of specialist plants collected by the Berkeley family since the gardens were created in the mid seventeenth century. The grounds also include a Butterfly House with hundreds of butterflies flying freely in a tranquil indoor garden, and a Walled Garden. 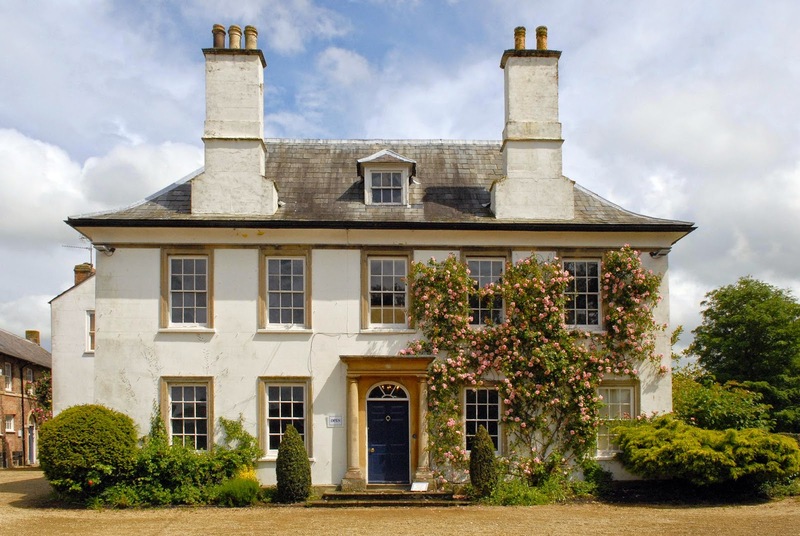 A few minutes walk from the Castle is the village of Berkeley, where you can visit the house of Dr Edward Jenner, the vaccination pioneer. Smallpox was the most feared and greatest killer of Jenner's time. It killed 10% of the population, rising to 20% in towns and cities where infection spread easily. Among children, it accounted for one in three of all deaths. From the early days of his career, Edward Jenner had been intrigued by country-lore which said that people who caught cowpox from their cows could not catch smallpox. Jenner observed this in his local area. These observations led him to investigate and experiment using cowpox as a means to prevent catching smallpox. 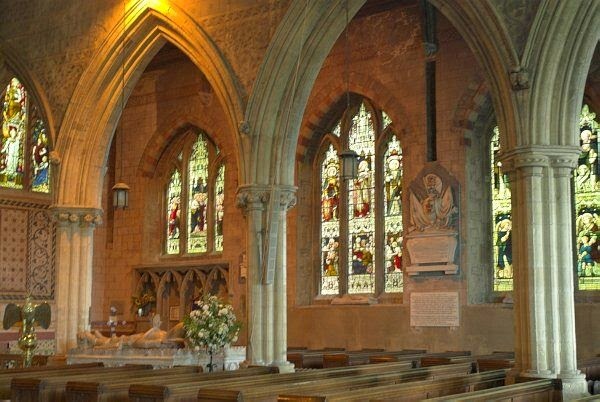 St Mary's Church in the village contains the tombs of the Berkeley family. 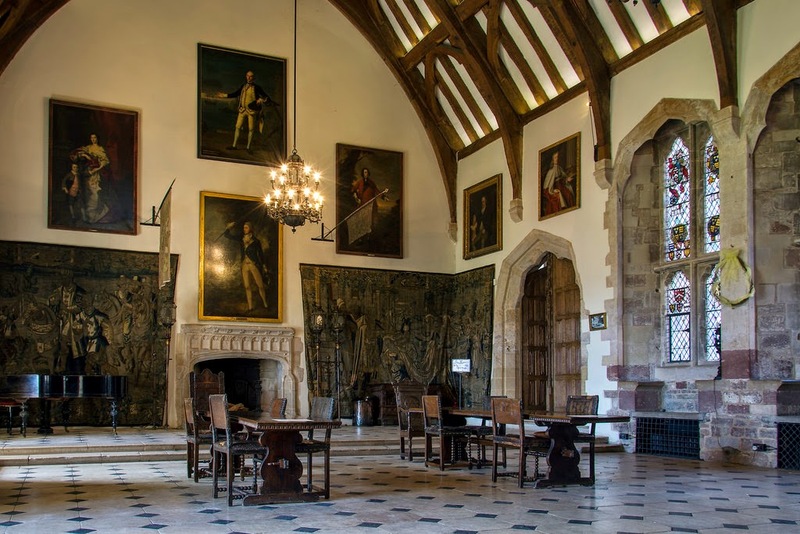 Berkeley Castle 2015 Brochure here. £27.00 - click here to book online. If ever there was a city with a story to tell, it’s Bristol. Enveloped in the hills of South West England, it has its own unmistakable identity, grounded in roots from centuries past and carved out since by passionate locals and spirited fans. 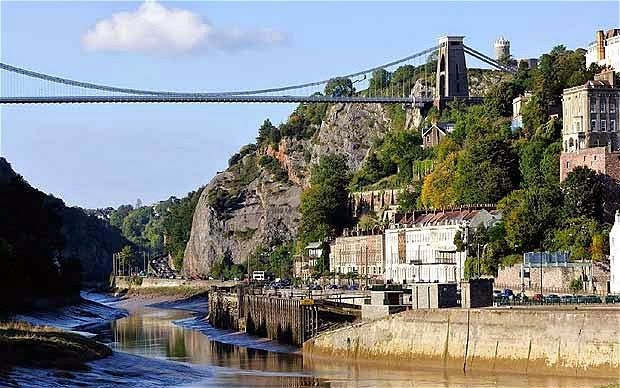 Bristol's prosperity has been linked with the sea since its earliest days. The SS Great Britain was the world’s first great ocean liner. Below decks you can peep inside the luxury cabins of First Class passengers. Eavesdrop on a conversation, dodge the harassed cook in his cramped galley, and marvel at the massive turning engine. Below the glass ‘sea’ is a fish’s-eye view of the world’s oldest iron hull. State-of-the-art technology keeps the air down there as arid as the Arizona desert to prevent rust attacking the ship’s delicate iron hull. 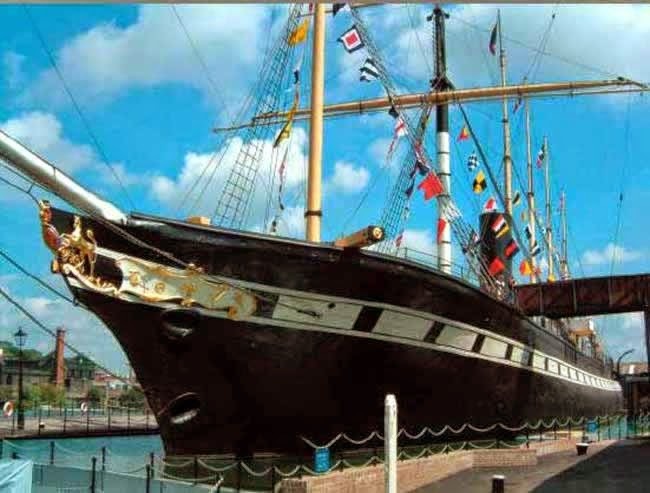 The Dockyard Museum tells the SS Great Britain’s remarkable story, from her launch in 1843 through a long career as luxury liner, emigrant steam clipper to a super-sized sailing ship carrying coal to San Francisco. You will discover the story of her rescue from the bottom of the South Atlantic and her final triumphant return to Bristol. From prehistoric times to the present day, M Shed tells the story of the city and its unique place in the world. 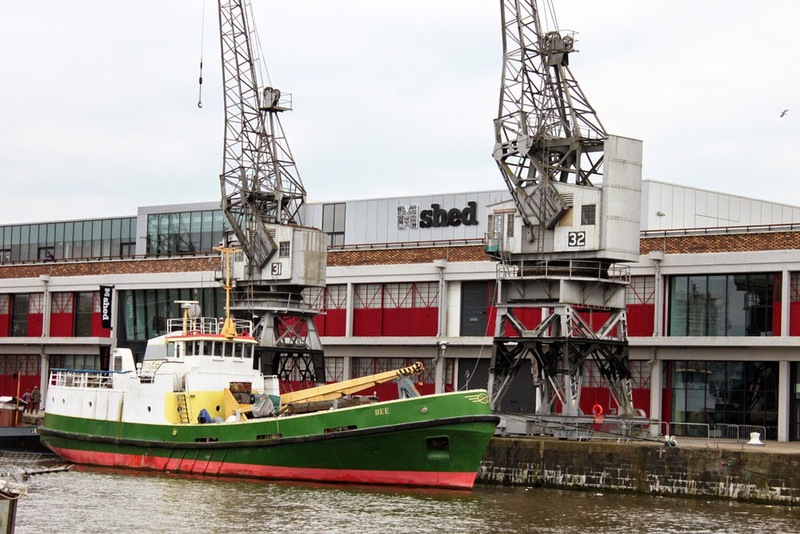 Set in the dockside warehouses, see amazing film and photographs, listen to moving personal stories, encounter rare and quirky objects and add your own memories of Bristol through the interactive displays. The Red Lodge Museum is an Elizabethan house. It took two whole years to put the Great Oak Room together. 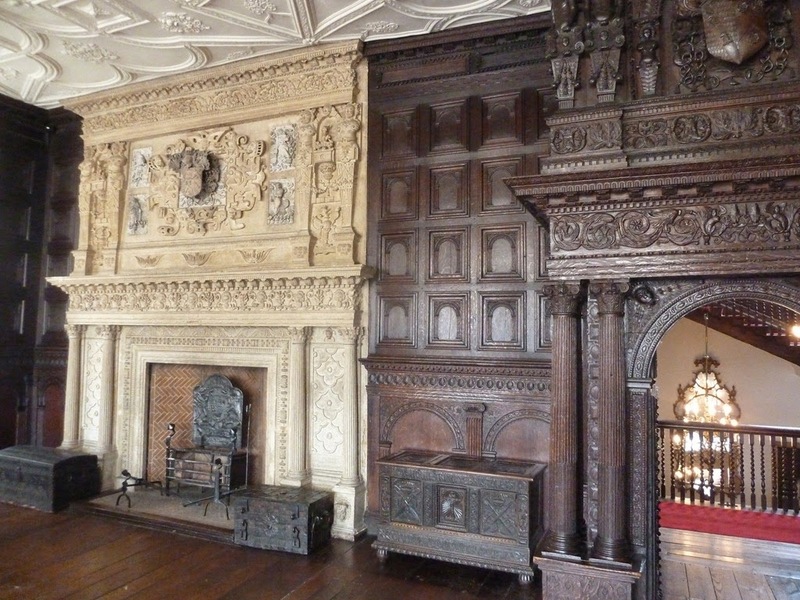 From 1578 to 1580 the top craftsmen of the day carved the oak, sculpted the stone and moulded the ceiling. John Young, a merchant who had the lodge built, wanted to use the room to show off to other merchants so decorated it with exotic motifs of the age. You’ll find a grand Elizabethan four-poster bed, wood panelling and sturdy oak furniture. There’s also a painting which might just be the earliest portrait of a slave in the UK. Bristol Museum and Art Gallery has collections of art, nature and history on display in a beautiful building. Fine art includes paintings by French artists, including work by Lucien Pissarro, Italian and Dutch paintings (with a huge painting of Noah’s Ark by Dutch artist Jan Griffier the Elder), British and European Art (The Age of Enlightenment and the Birth of Romanticism) and paintings from the 18th and early 19th century, including Thomas Gainsborough and John Constable. There is also a stunning array of ceramics, carvings and glass from China and Japan. British and European collections are displayed alongside locally made wares, including Bristol Delftware and Bristol Blue Glass. The Paint Pot Angel is in the main foyer of the Museum, and was donated by Banksy at the end of his hugely successful 2009 exhibition. 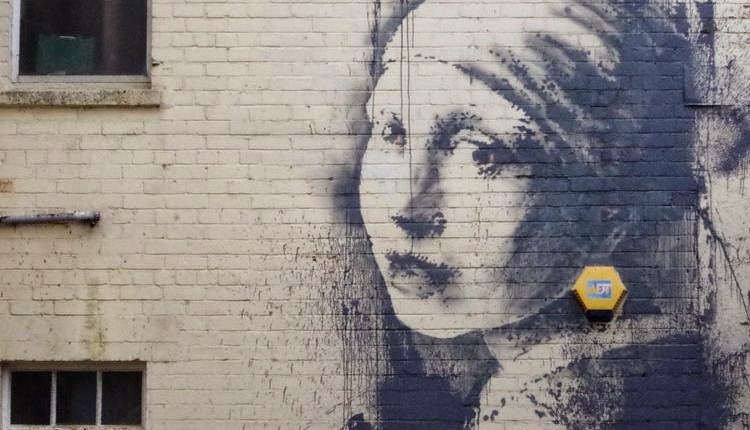 You can follow a Banksy Trail around the city. 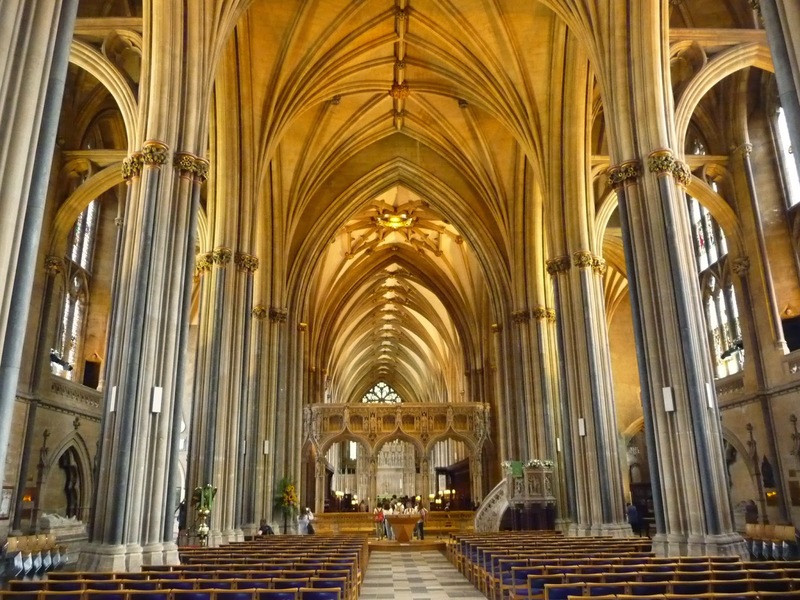 Bristol Cathedral began in the twelfth century as an Augustinian Abbey, founded by prominent local citizen, Robert Fitzharding. The remains of the abbey can still be seen in the Chapter House, the Abbey Gatehouse and the buildings of Bristol Cathedral Choir School, but it is the east end of the Cathedral which is particularly special; it is one of the finest examples in the world of a medieval ‘hall church’. This means that the vaulted ceilings in the nave, choir, and aisles are all at the same height, creating a lofty and light space with a series of elegant arches. The original abbey was dissolved by Henry VIII’s commissioners in 1539, and the nave that was being rebuilt at the time was never completed. The Church became a Cathedral in 1542 but did not get a new nave until the 1860s. Noted architect, G.E. Street, designed a new nave in a Gothic Revival design that mirrored the architecture of the hall church. J.L. Pearson then added the two towers at the West End and a further re-ordering of the interior was completed in the early part of the twentieth century. Banksy Self-Guided Tour Leaflet here. Bristol City Centre Map here. £23.00 - click here to book online. Penrith was once the capital of Cumbria. The attractive town is the hub of the Eden Valley. It is now an important shopping centre, with a good mix of traditional shops and sophisticated arcades. Leading off Penrith’s main streets are many old yard entrances with interesting inscriptions on the lintels. 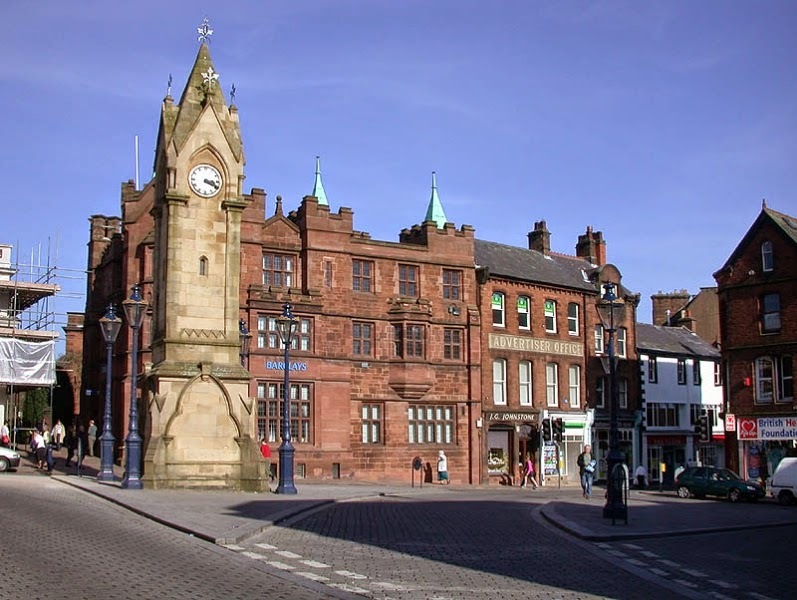 It was in the 9th and 10th centuries that the town became the capital of Cumbria – a semi-dependent state which, until 1070 AD formed part of the Kingdom of Scotland and Strathclyde. The two oldest streets, Burrowgate and Sandgate, date from the 13th Century. 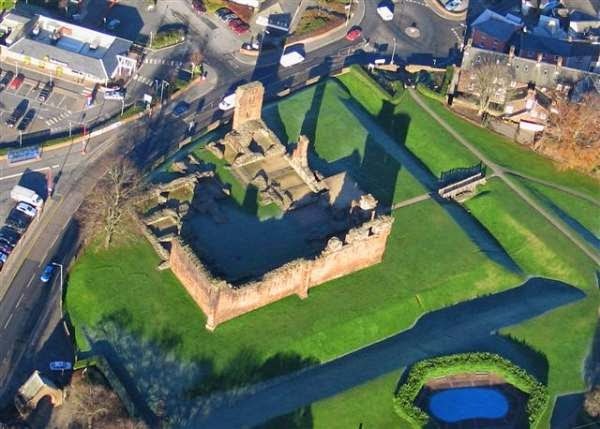 The imposing ruins of Penrith Castle have an intriguing past. It was begun in 1399, when a stone wall was added to an earlier pele tower. 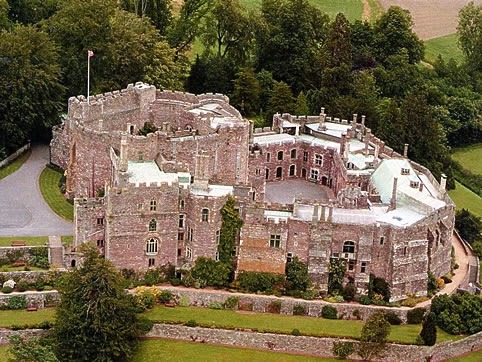 The castle was improved and added to over the next 70 years, becoming a royal fortress for Richard, Duke of Gloucester. 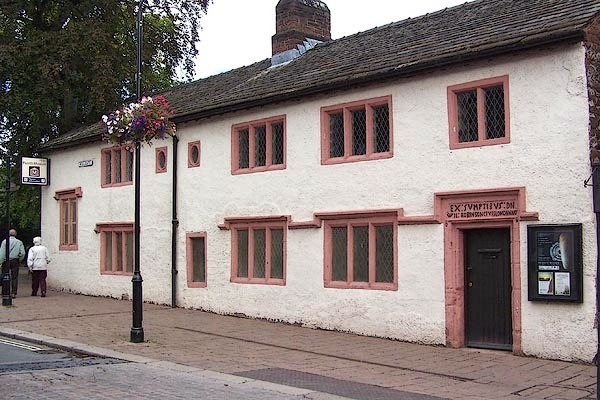 The Penrith Museum and Tourist Information Centre are housed in the former Robinson’s School, an Elizabethan building which was altered in 1670 and used as a school until the early 1970′s. The recently refurbished museum covers the history, geology and archaeology of the Penrith area. After lunch we visit Lowther Castle. The castle stands on a site occupied by the Lowther family for over 800 years. Being the third home on the site in that time, the current castle was completed in 1806 and a beautiful sculpture gallery with decorative plaster ceiling added in 1814; this is the only remaining room of the castle subsequently restored. The last family resident was the Yellow Earl, the fifth Earl, who left the castle on New Year’s Day 1936. 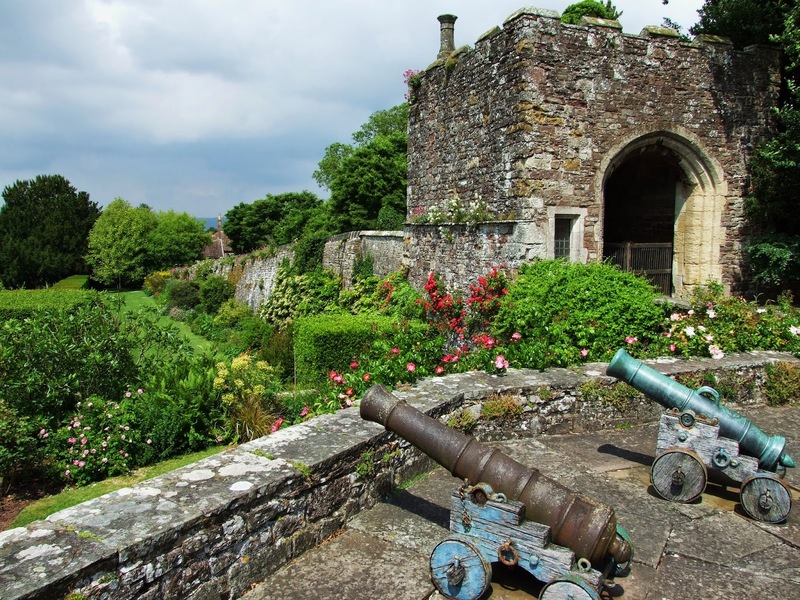 The castle was then requisitioned by the army during the second world war for secret tank weapon testing in the gardens. The sixth Earl sold the castle contents in 1947. After four years of trying to find alternative ways of saving the building, the late seventh Earl decided to remove the roof and all the interior structure of the building in 1957; the best solution in the circumstances to keep the building as well as protecting the rest of the estate from a £25 million death duty bill. Work to reverse 70 years of deterioration of the castle, gardens and stable courtyard started in April 2011, and a veritable army of craftsmen have been busy stabilising architectural features, restoring the Stables Courtyard, removing hundreds of tonnes of army concrete, and sympathetically installing modern services. The stable courtyard offers café, shop and a display area where visitors can find out more about the process of restoration. Lowther is a garden that was once asleep but after 70 years of neglect is now springing back to life, with an ongoing programme of restoration. The BBC Antiques Roadshow was recently filmed at Lowther Castle. 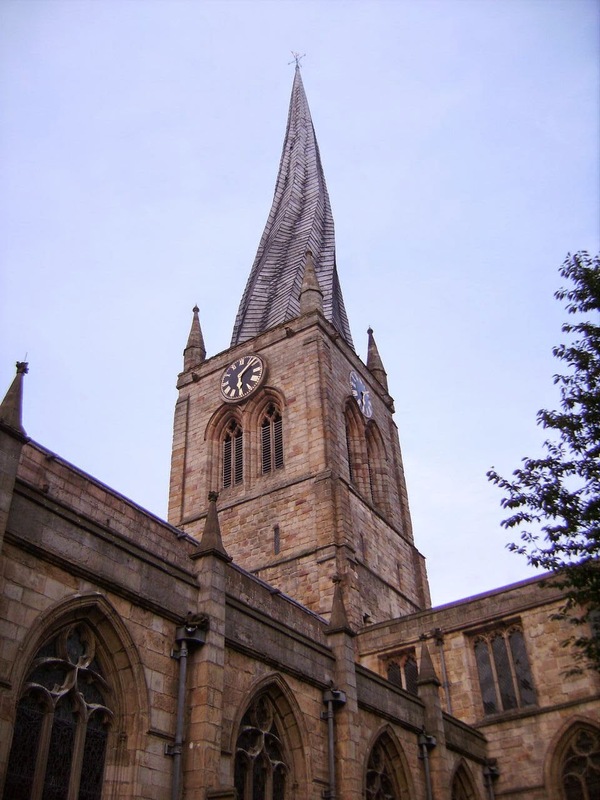 Chesterfield is a historic market town famous for the Crooked Spire Church of Saint Mary and All Saints. 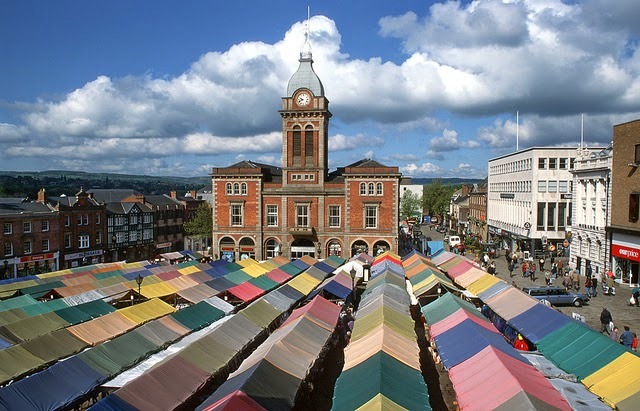 Markets have been held in Chesterfield since at least 1165 when the Sheriff of Derbyshire recorded an amount of £1 2s 7d from the market, but the town's Market Charter wasn't granted until 1204. Today the market has grown to be one of the biggest in the country. 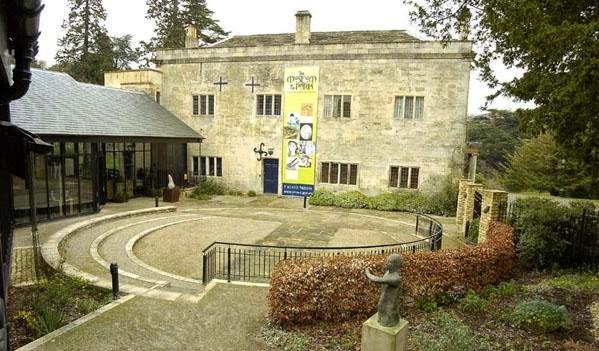 The Chesterfield Museum and Art Gallery traces the town's history from the day the Romans marched up Ryknield Street and built a fort, through the Industrial Revolution and the arrival of the railways (which brought George Stephenson to Chesterfield) right up to the present day. 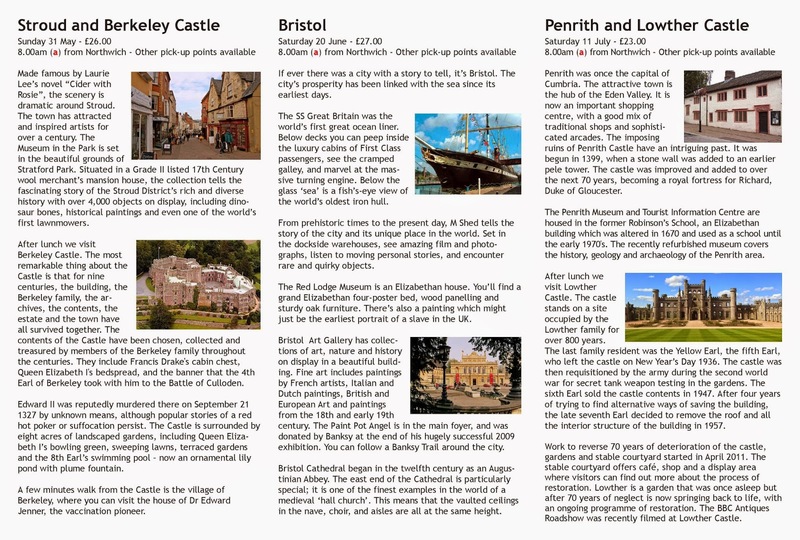 Pick up a Town Trail from the Visitor Information Centre and discover some of the less well known but equally interesting places of interest in the town centre, such as Secker's House and number 2 St Mary's Gate. 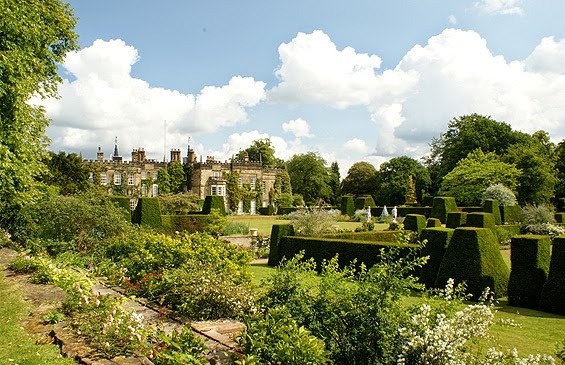 We then visit Renishaw Hall, built in 1625 by George Sitwell (1601–67) who, in 1653, was High Sheriff of Derbyshire. The Sitwell fortune was made as colliery owners and ironmasters from the 17th to the 20th centuries. Substantial alterations and the addition of the west and east ranges were made to the building for Sir Sitwell Sitwell by Joseph Badger of Sheffield between 1793 and 1808 and further alterations were made in 1908 by Sir Edwin Lutyens. 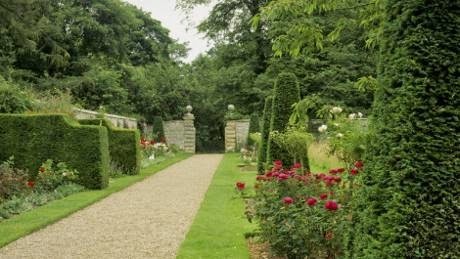 The stunning Italianate gardens (winner of the HHA/Christie's Garden of the Year 2015) were laid out in the late 19th Century by Sir George Sitwell. He was the brilliantly eccentric great-grandfather of the current owner Alexandra Sitwell. Walk around the formal garden enjoying the lawns and borders. Take a stroll down the lime avenue to see “The Angel of Fame”. Relax on one of the benches taking time to take in the beauty and tranquility of the gardens. Venture further afield through the woodland and down to the lakes. See “the classical temple” and other areas of interest on the way. The lakes are a haven for wildlife; look out for butterflies, dragonflies and birds. 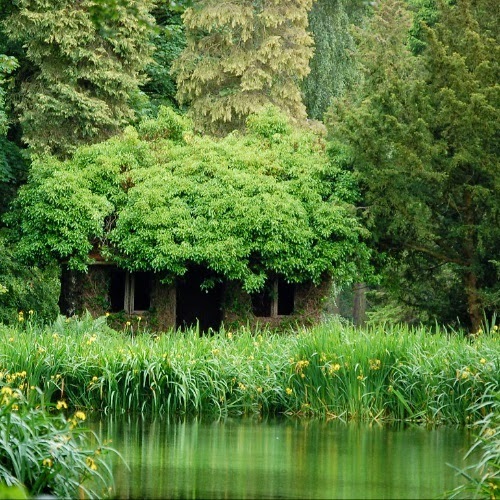 Follow the path round the lake to take in the stunning views, and then up through the woods back to the lawns. The current owner of Renishaw is Alexandra Sitwell, daughter of the late Sir Reresby and Lady Sitwell. Her extraordinary family have lived at Renishaw for nearly 400 years. The Sitwells have always been avid collectors and patrons of the arts and the history of the family is filled with writers, innovators and eccentrics. 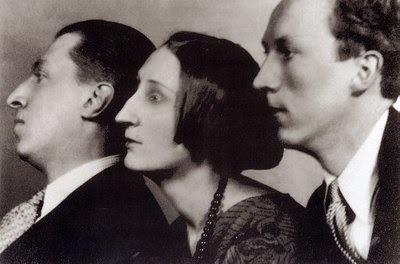 Perhaps the most famed of the Sitwells were the prolific writers Edith, Osbert and Sacheverell. Download 20 poems by Edith Sitwell here and watch a Face to Face Interview from 1959 here. £22.00 - click here to book online. 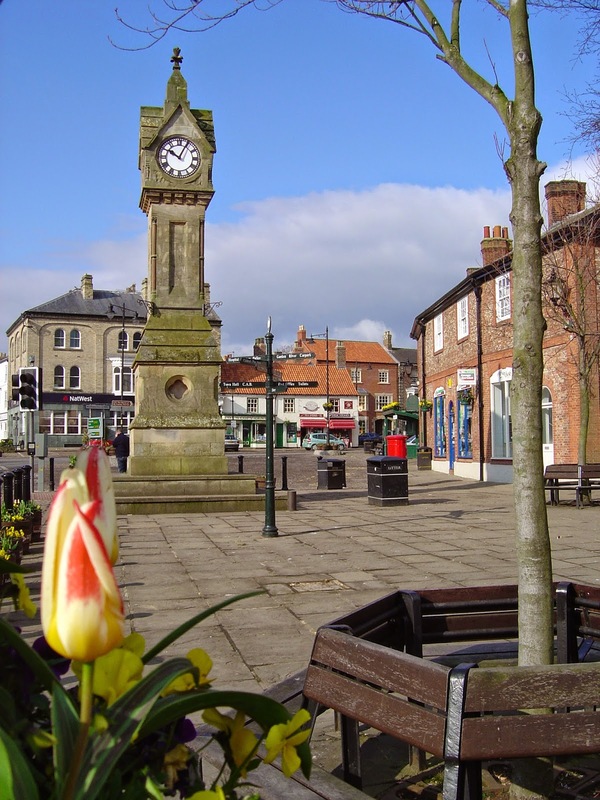 Thirsk is a traditional North Yorkshire Market town superbly positioned midway between the stunning North York Moors and the beautiful Yorkshire Dales. The town has a charm of its own, essentially unchanged and influenced by the world. 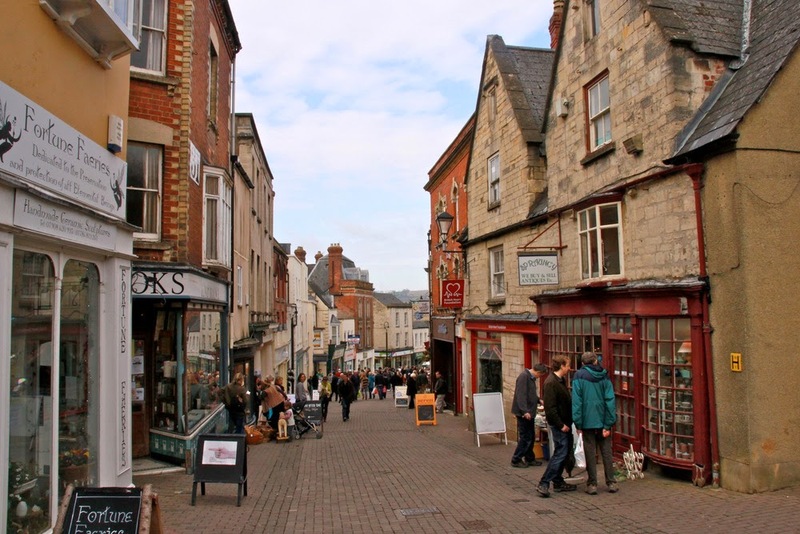 It centres around a bustling cobbled market square, dominated by the town clock, with its Saturday market and independent shopping. Visitors from all over the world are impressed by the warm and friendly welcome of the residents of this gem of a town. 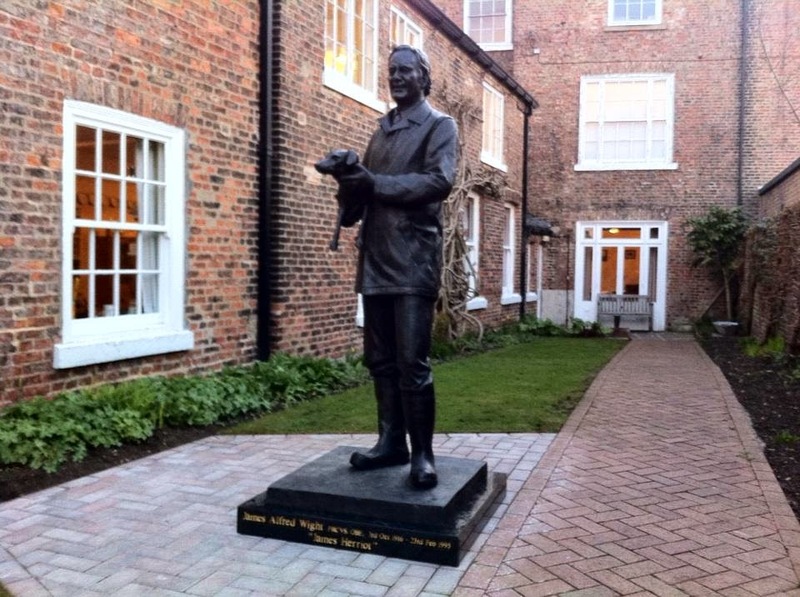 James Herriot, local vet and author, is Thirsk’s famous son. He wrote 'All Creatures Great and Small' and other stories about his life as a country vet. You can find all about him at ‘The World of James Herriot’, the award winning museum converted from his house and surgery. Thirsk has another famous son, Thomas Lord. The founder of Lord’s Cricket ground was born here in 1755 and his birthplace is now Thirsk Museum. There are eight rooms full of exhibits, featuring local life and industry, cricketing memorabilia, farming equipment, furniture, costumes and toys. Marvel at the bones of our Saxon Giant and shudder at the legend of the Busby Stoop Chair! 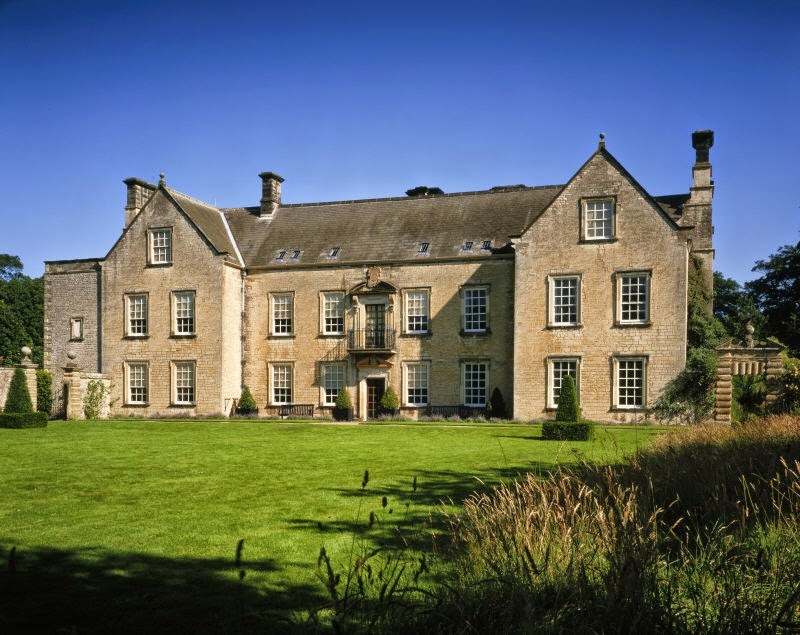 After lunch we visit Nunnington Hall (NT). The sheltered walled garden on the bank of the River Rye, with its delightful mixed borders, orchards of traditional fruit varieties and spring-flowering meadows, complements this mellow 17th-century manor house. From the magnificent oak-panelled hall, three staircases lead to the family rooms, the nursery, the haunted room and the attics, with their fascinating Carlisle collection of miniature rooms fully furnished to reflect different periods. This remarkable collection was formed over a period of 40 years by Mrs F.M. Carlisle. The collection consists of 16 individual rooms containing furniture and accessories at usually one-eighth of their natural size. Skilled craftsmen were commissioned to make musical instruments, furniture and other accessories some of which are made from ivory, glass, porcelain and silver. The Hall also hosts a programme of high profile exhibitions across the year - when we visit there is a exhibition of work from well-known children’s literature. Download James Herriot's Books for Free here. Download/Print the Summer Tours Brochure here.